The Criss Cross Cowl features an intriguing cable that is knit through itself rather than simply crossed front to back. It is knit in the round from the bottom up and looks great on both men and women. This cowl is part of a set of four pieces: Cowl, hat, beret, and fingerless mitts. 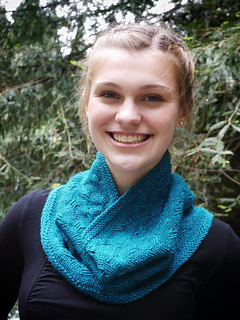 You can purchase the cowl pattern on its own for $6, or the four piece collection for $10.